Goodbye 2017: A New Beginning. This was the year of Badin. 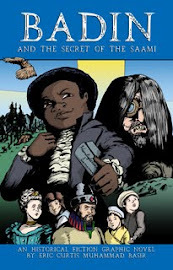 Moreover, it was the year of my graphic novel, Badin and the Secret of the Saami. I sold out at Chicago's largest comic book convention. I presented the book and was an honored guest at the Museum of Ethnography in Sweden and University of Tromsø in Norway. 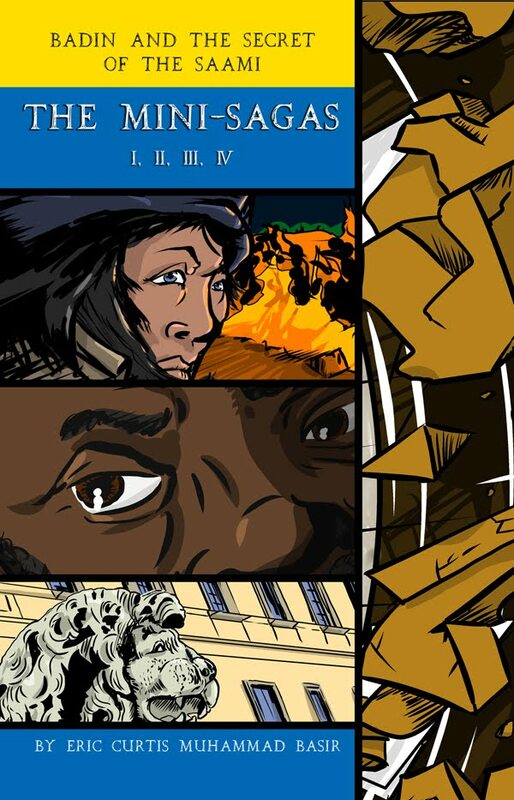 The accomplishment of completing an historical fiction graphic novel was a glorious feat. Very few human beings can make such a claim! However, not all has been wonderful. In fact, it has been somewhat disastrous. The perception of success and wealth for achieving this goal was the most frustrating aspect. So many people followed my progress as I posted updates and journal entries. They all assumed I was making profits and was well-off (second-hand suits and shirts can be deceiving). Quite the opposite was true. Finding work (in and outside of my industry) was especially difficult because of this false perception. Self-publishing my book—and reaping the consequences of the financial sacrifices required over the past 4 years—have been the final nail in a coffin of 18 years of self-employment. Would I do it again? No. Would I do it if I had to start all over? Not the way I did it. I believed a little too much in my skill as a salesman, writer and artist. I put too much hope in the concept of getting a literary agent—and put very little effort into a plan of action should I be unsuccessful in obtaining said agent. Without mentioning details, a "perfect storm" of personal, financial and business misfortune brought my family and I into a pathetic financial state of affairs. The good thing about all of this is that I went out as a champion and changed a 200-year old racist narrative about a Black noble of 18th century Sweden. For the entire four years I focused on this book, I never gave up and did my best. Moreover, I do believe if I borrowed all the money needed to print the book in bulk and tour the country's comic book conventions, I could have sold out. However the debt required is a burden I am unwilling to carry. Regardless of intentions and effort, hard work does not always financial ensure success. Also, just because you do something good for humanity, that doesn't guarantee recognition while you live. This is the hard reality of following your passion. So in January 2018, I retire from leading Photo Grafix and Black Rhino Illustration to start a new career and lift my family out of poverty! My full-time labor as an illustrator, retoucher and instructor will come to an end as I put my customer service skills into a new industry. For someone my age (I am over 40), it is not easy to change careers. I'm lucky that I have good health. I'm also lucky that my new job has a strong labor union, medical benefits and many paths toward more responsibility. I like to count my blessings. My son and wife will continue serving current customers and manage the stock art portfolio and other on-demand courses and books that I developed over the past 18 years. That includes marketing. I'm passing this all to them and leaving them to decide the direction (and ask me what they want to know). Meanwhile, I will focus on training for my new career. This will also include ongoing continuing education and an attempt to re-enroll in college and obtain the credits required to [finally] earn my undergraduate degree. My love for art and teaching remains strong, however. There is still the unfulfilled Badin and the Secret of the Saami Book Tour (the fundraiser is still live), a Swedish version of the book (completed, but not repaginated), a Special Edition AND a sequel. 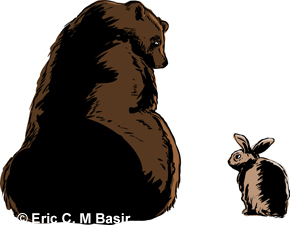 There is also my love for creating stock art (I have a portfolio of over 7,000 illustrations represented by agencies around the world). I also enjoy teaching occasional webinars and workshops about photo restoration. So after I finish training for my new position, pass through the probationary period and build up seniority to have a schedule, I will tend to these special projects on a very limited basis. To those of you who believed in me and my efforts, I thank you! It has been a wonderful journey. I hope and pray that I brought some happiness and enlightenment into your lives. As I sit in a train car near one of the world’s largest mines, I wanted to assess the value of the past two and a half weeks. The end of my journey in Scandinavia is coming soon. I met, learned from and shared with many people. I proved to others and myself that Badin and the Secret of the Saami is a valuable tool to inspire and teach adults and children. I was blessed with trials and triumphs. If I never return again, I feel at ease that I did my absolute best. 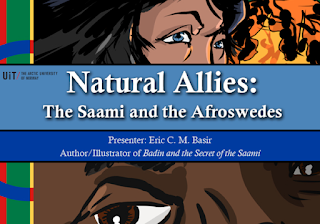 You are invited to an open lecture entitled: Natural Allies: The Saami and the Afroswedes with guest lecturer, graphic novelist, Eric C. M. Basir, from Chicago, Illinois. 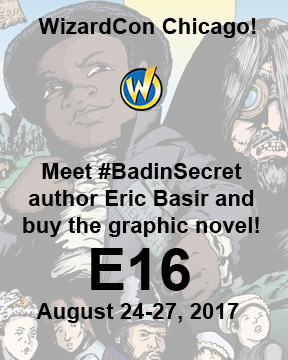 Eric will share his motivation and methods for incorporating South Saami culture into his recently released historical fiction graphic novel Badin and the Secret of the Saami (2017). The lecture is held in conjunction with HIF-3620 Indigenous Revitalization: Languages, Literatures and Arts course. The lecture is open to everyone, but students and researchers with an interest in Indigenous, diaspora, and minority representation and issues, graphic novels, and transmedial narrative are especially encouraged to attend. Special thanks to Ellen Marie Jensen for writing this description. 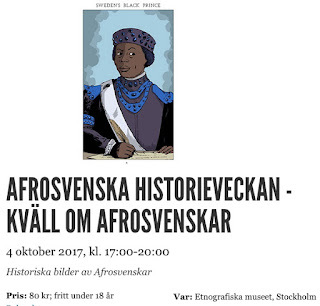 October 4: A Night about Afroswedes at the Museum of Ethnography in Stockholm, Sweden. Special thanks to Kitimbwa Sabuni and Michael Law-Barrett for making this happen. October 16: Natural Allies: The Saami and the Afroswedes at the University of Tromsø in Norway. Special thanks to Åsa Virdi Kroik and Ellen Marie Jensen for arranging everything. I also thank Terry Marttinen for inspiring the title of this lecture. She is a Medical Historian specializing in the history of colonial genetics. Again, there are many things up in the air and I'd rather not put them out here until they are confirmed. Stay tuned through Twitter and Facebook for updates. Four years ago in October, I swore I would never return to Sweden. I hated the country, the white people who lived there—and in the USA—and could not wait to get over the pain of a humiliating experience. However I did it for my mother and her family. They had lost all contact with relatives in Sweden almost a century ago and I became the bridge to reunite them. That was a worthy sacrifice. Nowadays, I just hate one white person (he's actually more like an orange person with raccoon eyes and hideous comb-over). However, I have never met a Swede that likes him either. Much has changed. 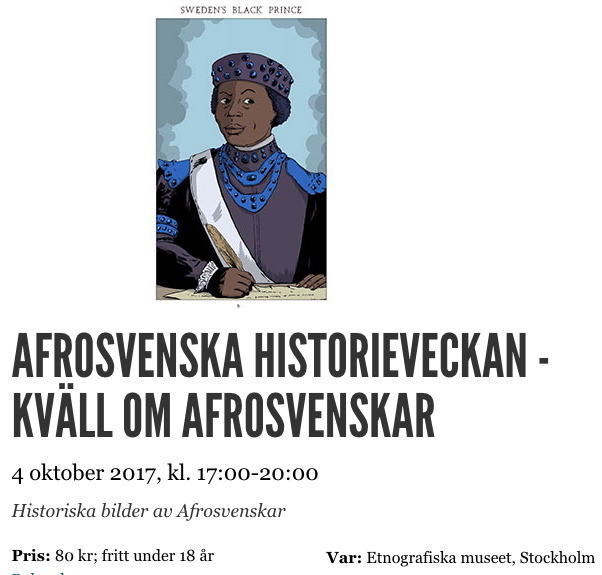 In fact, thanks to my fellow Afroswedish brothers Kitimbwa Sabuni and Michael Law-Barrett, I have been invited back to Sweden as an honored guest at the Museum of Ethnography in Stockholm for a series of events during Black Swedish History Week. However, this time I'm not going as recipient for a gift from the Swedish people. 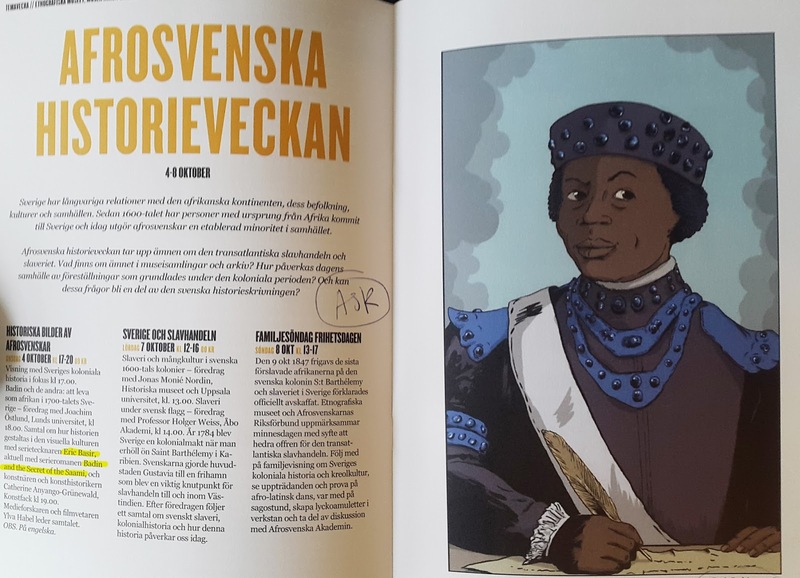 I am going as a gift-giver to the Swedish people: The sharing of a tool to heal the divisions in its society through a completed graphic novel about—and a full vindication of slander for—Sweden's most famous citizen of African descent: Adolf Ludvig Gustav Fredrik Albert Badin. As a supporter of my work, I need to ask for your immediate help. No, I won't bother you about my 2018 book tour right now. I have something more immediate: If you live in Sweden, I need you to attend this event—and events through October 7. Moreover, I need you to invite politicians, community organizers and religious leaders. This includes media. Frankly, I have had very poor luck getting any response from anyone! I believe all my email messages are being sent to junk mail. I especially need to meet with the Swedish government's Minister of Culture: Ms. Alice Bah-Kuhnke. I can do this while I am in Stockholm. I hope she and others can come to me while I'm at the museum. However, I think I can arrange ways to meet with them in their offices. It is important that we get the ball rolling for an official government recognition of Badin as a member of the Royal Family and a Prince of Sweden. One Month Until I Go To Sweden! In a little over one month, I will return to Sweden as a guest panelist for a program at the Museum of Ethnography in Stockholm. I am very excited to be on this panel. We will talk about historical pictures of Black Swedes. This panel will be moderated by Ylva Havel of Södertörn University. With me will be art historian Catherine Anyango-Grünwald and Joachim Östlund from the University of Lund. It made me so happy to see that Michael Law Barret and the team at the museum used my re-imagined portrait of Badin in the brochure (top-left). I have been studying the Swedish language for 3 years now. So I am hoping it comes in handy, as the other two segments will be in Swedish. Do you remember my book tour in Sweden? Well, it's still going to happen. Unfortunately, due to my failure to raise enough money in time, it must be postponed until 2018. So please spread the word and contribute. 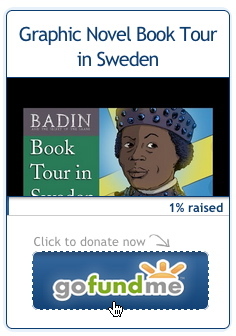 I need your help to inspire a new generation with a new folk hero: Sweden's forgotten Black Prince: Badin. I was thrilled to sell copies of Badin and the Secret of the Saami and do a lecture at the Chicago Retcon earlier this month. I met many new customers and allies. The privilege of speaking about Telling Historical Fiction Through Sequential Art was the highlight. I have posted a video of it from Facebook live to my YouTube channel above. Retcon was alot of fun. Traffic was a bit slower than I expected. But the staff, volunteers and overall spirit was fantastic. This was their first year and this was my first convention as a creator. It was very affordable, child-friendly and I am looking forward to doing it again. Geeks A Gogo wrote a detailed article about the convention. They even featured me in one of the pictures drawing a doodle. One of the highlights was a surprise meeting with the man who first taught me how to draw cartoons, Tim Jackson. I hadn't seen him since grade school. I got a picture of us along with his granddaughter at Retcon. He is the author of a fun to read history book: Pioneering Cartoonists of Color. My next convention is Wizard World Comic Book Convention in Chicago. 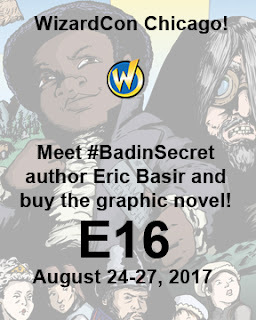 I'll be in booth E16 with a fantastic writer and creator of the Yi Soon Shin historical fiction graphic novel, Onrie Kompan.